Chinese New Year is round the corner. One of the best things about CNY is getting to taste the different dishes that the aunties dish out. These are fiercely protected recipes and these traditional dishes are usually showcased on this special occasion. I’ve never thought of CNY as a holiday because I swear the eating and visiting completely wears me out. But the food is always worth it and it takes a huge amount of self-discipline not to overindulge at this time. In my family, it is the “older generation” who host the family meals. I shudder to think what would happen if they stopped doing so – I would not look forward to doing so because I’ve always felt that I’m more comfortable cooking western type dishes than Chinese food for large crowds. This is because our traditional dishes take a lot of laborious preparation. An aunt once told me that her CNY preparations start about 3 weeks prior – it takes that long to soak the buah keluak seeds I guess! 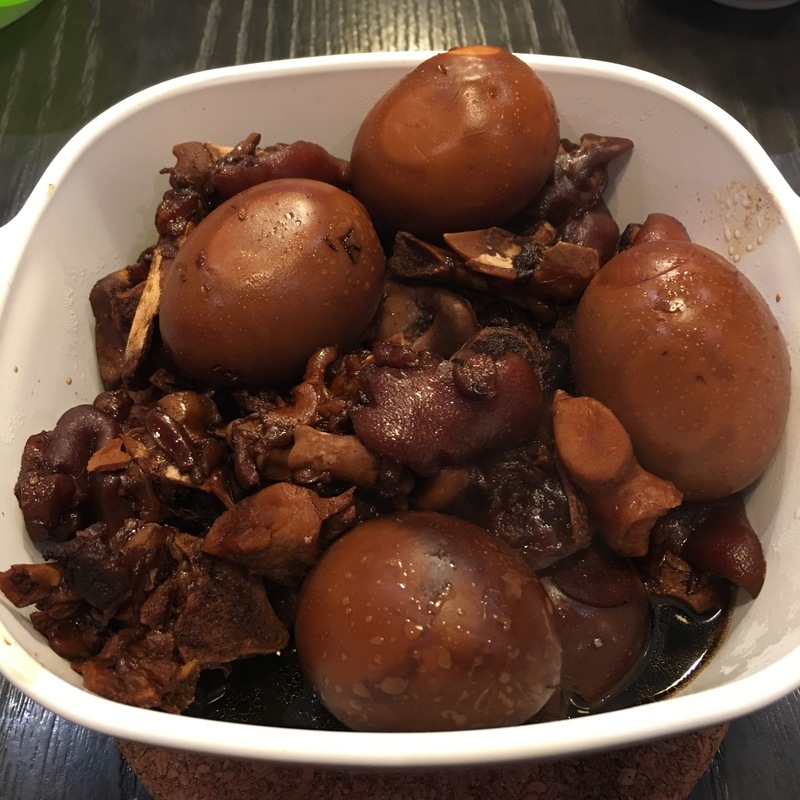 One of the dishes I’ve always enjoyed is a black vinegar pig trotter stew that actually is served to new mothers as part of their confinement diet. I’m not quite certain why this dish is also served at CNY but I guess this gingery, sour, sweet lusciously fatty dish is uniquely appealing. Most times it takes absolutely hours to make this, but I decided to experiment doing it in the Instant Pot. Verdict – easier and quicker than the original cooking method, but I think there is something about a traditional long braise that reduces the gravy to syrupy thickness. Still, I think this was not bad for a modern cook (who doesn’t want to stand at the stove for 4-5 hours). This recipe still uses the traditional ingredients like black ChinKiang vinegar and sweet black vinegar which may not be really accessible in other countries, but who knows…I did see frozen Singapore spring roll skins in Greece! A Chinese grocery in the most remote country may still have the makings of this recipe. 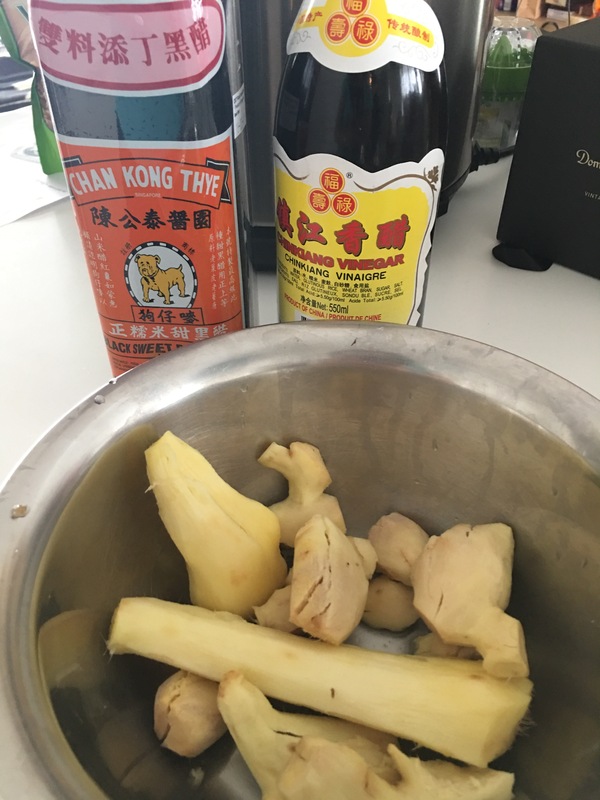 The 3 essentials of this dish – old and young ginger, the “Bulldog” sweet vinegar and ChinKiang vinegar. Just a side note to people doing low carb – this is not the lowest carb dish as there are hidden sugars in the sweet vinegar and of course, palm sugar is sugar. However when I’ve eaten this dish I usually take the eggs or meat and try not to take too much of the gravy – so far I haven’t really spiked too much. Clean the pig trotters and cut into 3-4 cm long pieces. Blanch in boiling water and transfer to cold water and wash off the impurities. Put the Instant Pot on sauté mode. Heat up the sesame oil and sauté the ginger pieces for 2-3 minutes. Add the pig trotters in and sauté for another 5 minutes. Add the sugar substitute and mix well. Sauté for another 1-2 more minutes. Add the vinegar, water, Soy Sauce, Chinese wine, salt and palm sugar and stir well. Add the red dates and eggs, ensuring that these and the pork pieces are submerged in the liquid. Seal the pot and manual pressure cook for 45 minutes on high pressure. Allow NPR for about 10 minutes. Open the pot and taste the gravy – you may need to adjust the flavours with salt and sugar substitute. Remove the pork and eggs and put into a large casserole dish. Put the pot back into sauté mode and boil for another 15 minutes to reduce the sauce. When done, ladle the sauce over the pig trotters and eggs. Serve hot with cauliflower rice.